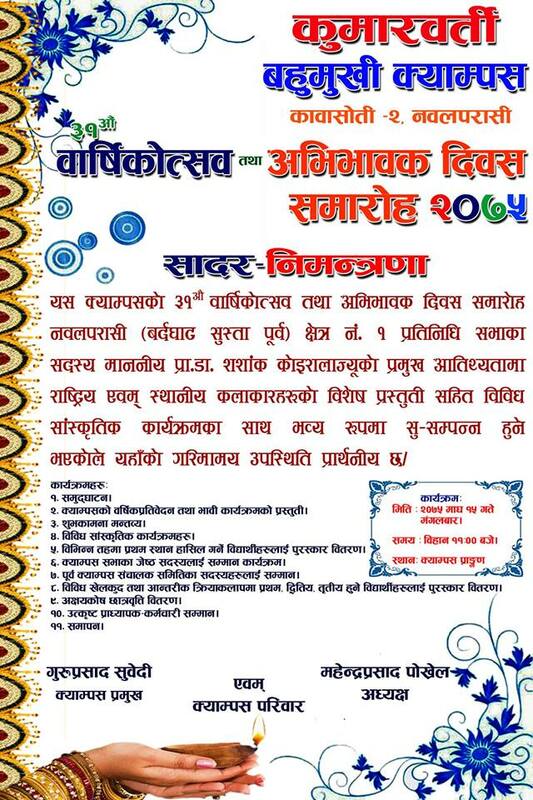 previously known as “Kumarwarti Commerce Campus” is the first higher education institution established in Nawalparasi district with collective effort and support from 37 village committee, intellectual, pedagogist, teachers, social-activist, business houses, employees, farmers and local people. Let’s be proud of being one of the inmates of Kumarwarti Multiple Campus, the first public higher educational institution of Nawalparasi with outstanding results, either in the role of a student or a teacher, or the management committee or an official. We believe in “all that glitters is not gold” and all that does not glitter is not rusted iron. We focus on teaching and learning as per the need of students and we are quite hopeful that students would be sensible enough in the choice of institution further learning. All the social and political engineers, guardians and people in general are requested to send their wards in this institution to see whether its physical infrastructure, academic environment and spacious landed property are upto their expectation. "I love Kumarwarti Multiple Campus so much, that I will definitely be failing the class and join them again!"